Item is a photograph of a procession of graduates at the 1926 spring convocation ceremony at Dalhousie University. 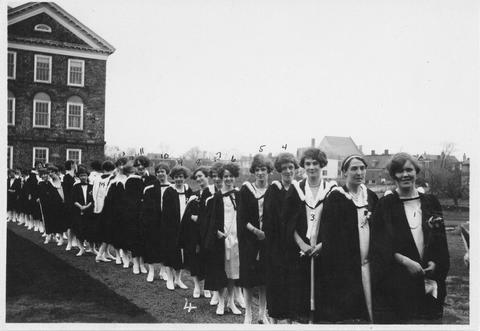 The photograph shows Elinor Barnstead; Molly Beresford; Dorothie Berry; Agnes Bown; Marion Campbell; Marjorie Colquhoun; Margaret Crocker; Josephine Dresner; Allison FitzRandolph; Edith Hallett; Ruby Hayman; Evernia Jensen; Charlotta Johnson; and Vera Knox standing in line outside the Science Building (Chemistry Building). Photograph is accompanied by a piece of paper listing the subjects of the photograph. The photograph is labeled with numbers that correspond with the list.